For some of you out there, you get a little nervous when you hear the word “adulting”. You think to yourself: how am I going to pay for all my bills, who is going to do my laundry, am I going to have to make the doctor appointment all by myself and much more. 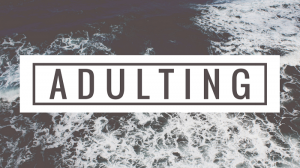 While there are many tips and tricks out there for “adulting” I am here to tell you why it’s a good thing to become an adult. You get to develop your own point of view. This is your time to shine now. For your first time in your life, you are able to make choices on your own. You get to pick what direction in life you want to go (and let me tell you that might change a lot especially in college). Make your own decisions on whether or not you want to go to that party, if you want to hike all the way to picnic point or if you want to eat at the food trucks every day. The choice is yours now. You have personal goals and values that you get to set. Just always remember to be true to who you are and don’t let anyone change you. Being a college student we get invested in many outside of school activities. Whether that’s with clubs, intermural sports, jobs, being an athlete or whatever else it is. We keep ourselves busy 24/7. But I am here to tell you that it’s okay to be doing nothing. Take time to relax and enjoy the moments you have while in college. Head on over to the terrace and watch the sunset with your friends. Or even stay in your room all day and do nothing. Yes, I did just say do nothing. Because doing nothing is perfectly okay to do. Transforming into an adult can be a lot for some of us. I’ve noticed that many of us, myself included, get weird when it comes to asking others for help. I think it’s because it makes us feel vulnerable. We think we should do be doing everything alone since we are “adulting” and if we ask for help we are not doing it right. But be easier on yourself. Other people are put in this universe to help and support us. One of my favorite quotes states “It’s okay to ask for help. When we stop asking for help, we put our own health and sanity at risk. We need each other to survive and thrive.” Always remember this.